In-ear headphones are one of the on-the-go music listening options that many people choose. They’re light, practical and very easy to keep exactly where they should be – in your ears. Having a plethora of options to choose among, you’re probably asking yourself which ones to buy. Bose is a rather popular name in the world of audio equipment. The Bose SoundTrue Ultra In-Ear Headphones look beautiful and futuristic. Going beyond appearance, however, do these headphones have enough to offer? The first and the most obvious thing to talk about is the quality of sound these headphones are capable of producing. Bose SoundTrue Ultra have a soft seal that’s used for passive noise reduction. The seal increases the quality and the purity of the music. These are the first Bose in-ear headphones capable of doing noise cancellation, so if this is the variety you’re interested in, you’ll definitely enjoy the innovation. Most people that have reviewed this set are particularly happy with the quality of the sound. The bass is relatively low but there are realistic middle and crisp high tones. 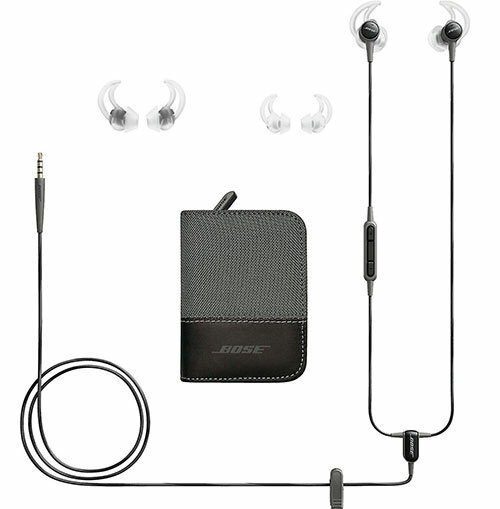 Bose in-ear headphones come in three sizes, thus you can make sure that the fit is going to be perfect. You will also get the StayHear Ultra tips that will keep the earphones in the right place, whether you’re waiting for the bus or jogging. Very durable: the earphones are both sweat and weather-resistant, thus they can be used by active individuals that do a lot of exercise. These two features will increase the lifespan of the headphones and also make the experience more pleasurable for the wearer. Very comfortable: on top of being tough, the headphones have a nice design and they’re made of materials that increase the comfort level for the wearer. Can be used to answer calls: if your phone rings while you’re listening to music, there’s no need to take the headphones off – SoundTrue Ultra In-Ear can be used to answer calls. The three-button inline remote makes it easy to switch between music and telephone conversations. An in-line microphone is also available. Sufficiently long cable: the cable of the set is long enough to provide comfort during movement. The cable also features a T-joint design that reduces the risk of hearing rustling while you’re on the move. A small carrying case is available: this is great, if your headphone cable usually gets tangled in your bag and let’s face it – this happens all the time. Expensive: Bose technology is known for the quality, which means you should be prepared to spend more than what you’d dedicate to other headphone varieties. No wireless version: the headphones aren’t versatile and you can’t remove the cable. Not good for people that like deep bass: the bass isn’t deep or incredibly reach. People that like a lot of bass in their music listening experience will not be particularly impressed by these headphones. In-ear headphones usually provide convenience but they aren’t recognized for the quality of the audio. Bose SoundTrue Ultra is an exception. These little headphones can compare to some traditional headphone varieties and still do a decent job. Very comfortable and lightweight, these are perfect for every active individual that likes listening to music on the go.